Why do we want to create a vision for our life? Do you know that everything is energy? What we put our focus on is what we get in life. Working with a vision is called the dream building process. What would you love? You have 12,000 to 60,000 thoughts a day and 95% of them are unconscious. You don’t even know that the brain is hacking into your vision. These negative thoughts are embedded in the life you are creating. You can change that through shifting your thoughts with a powerful vision. Putting your vision into writing empowers it. It makes it real. Start with a fantabulous vision board. Mostly people are sight learners so the teacher coming out in me says you can create a powerful visual to start then work this vision board. Putting it behind your dresser until next Jan.1st will fuel your dream half-way. Creating and working your vision with the following 7 steps will fuel it so you can create the life you would love. Flipping through magazines, etc. to dream and get excited is Step 1. Step 3: Sit with your vision board for 10 minutes imagining yourself being and doing the things you placed on your board. Step 4: Write one, two or even three pages about your board. Make this writing in sentence form. No need to worry about spelling or punctuation. We are working with images….your vision….not an essay that is being graded. Step 6: Add to the end…’This or something better still’ because you don’t know what doors will be presented by the Universe as you get clearer and clearer about what you want and you tell this Universal Energy what you would love. Step 7: Work this vision. Stand in front of the mirror and read it out loud. Get excited when you read it. The Universe hears the vibration of emotion rather than just words without emotion. Read this 2X a day for one month then 1X a day for the next year. This takes 5-10 minutes. Your life is worth this expended energy. If you know how this vision that you created will come to pass, then the vision is not big enough. No kidding. The Universe will conspire with you to bring about amazing things in your life. Go for the gusto of what you would love. It’s about staying focused on your vision and not having your unconscious thoughts hack what you would love. We all came here to share our gifts. What are your gifts and what will you do to serve others? Many of my clients continue to get coaching to help them stay focused on their vision. They are doing amazing things for humanity and you will also. Contact me if I can support you to create your vision &/or to work your vision. Forgiving so I could feel better about myself is not why I forgave my parents. Forgiving them was to release the energetic string that I had tied around them like an umbilical cord. It connected all three of us so deeply I was not seeing ME in the picture. It was a dark and cloudy day at a cemetery east of Cleveland, Ohio. 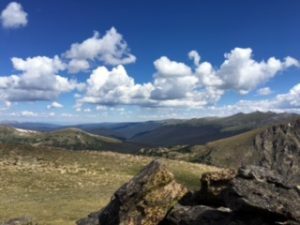 After spending many years in therapy trying to make sense of the various memories that were hijacking my life, I began to see that these memories owned me. I could not embody the life I saw as mine because I held them as an excuse for not being me. Confusion always popped up as my word of the day. So on that dark and cloudy day at All Soul’s Cemetery east of Cleveland, I sat by my parents grave. Yes they were buried next to each other even though they had been divorced for 20 years. Coming to one gravesite made it easy to do forgiveness. I thought about the times I would wake in the middle of the night and my mother would be in bed with me…not my sister. I remembered the fear I felt knowing what would be next when my father cornered me in the bathroom. I thought about the time as a teen, I bolted out of bed having heard a huge ruckus and ran down two flights of stairs. Etched in my mind are the frightful faces of my younger siblings sitting at the breakfast table attempting to eat their cereal. There was my mother lying on the floor across the kitchen. My father had planted his fist in her face so hard that she and her cereal were separated. PTSD for many years to come was my reality whenever similar sounds occurred while sleeping and I would jump awake. It wasn’t until I attended workshops at the Academy for Coaching Excellence https://acecoachtraining.com that my journey began to make sense. I was a compassionate, caring and kind woman. I was giving away my power to the excuses I was making. The stories I was telling myself were more powerful. Once I accepted that I am not my stories, I began to see the endless possibilities for my life. Experiencing little emotion behind the thoughts was my indication that healing had occurred. I had cleared at a cellular level and was ready to move on when the string binding the victim to the story was severed. I was ready to infiltrate my life with friends who loved me and experiences that shifted the rumination of all that had occurred in my formative years. More than anything, I was ready to cut the umbilical cord and free my parents to rest in peace. Saying without anger that my parents did the best they could with what they had at that time of their life was more powerful. Releasing them from the cable that had held them to me was freeing. I knew that I loved them for who they were…my life bearers. Throughout my mother’s last days, black birds became a sign for me. They would sit in the trees in my backyard, appear when I was in nature and show up while I was driving to visit her. Wouldn’t you just know it? There they were at my parent’s gravesite to confirm that I was on the right path. The dark and cloudy day turned to a sunny day…really…the sun came out and I could feel the warmth. Everything is energy. I was determined to use the energy of my caring, compassionate self to make a difference rather than continue using the energy of my victim stories. I was going to rock and roll with the difference I was here to make. No kidding! What is the one gift that you came here to share and you know your life makes a difference? Suppose, just suppose that you knew you were more powerful than your experience at this moment. Would it be alright with you to see this power expressed? Would it be alright with you to know that if you can see it for yourself, you can be it, do it, have it? It has taken me a long time to be alright with my personal power. After all, I have this inner critic hijacking my power every moment of the day. Guess what? So do you. We all do. It’s in our DNA to have our brain telling us what to do or not to do to keep us safe? So what is in our DNA? The conversations that we have been listening to for the better part of our life. The conversations that we hear over and over. We hear them so often that we think they are true. For example: “I don’t have what it takes to do this.” “I don’t have enough money.” “I shouldn’t bother because it has been done many times before.” ” No one’s going to care anyway.” “There isn’t enough time.” If one or more of these phrases is part of your stream of thought, welcome to the human race. Every single human being has one or more of these phrases running their lives unless they have learned to shift their focus to what is more important to them. What are your Unexamined Assumptions to shift your focus from? came me to do in this lifetime. Sign up for the newsletter to download my ebook, Step Up Step Out: Share Your Gifts and Be an Agent for Change, for FREE! Available for a limited time. Translate Stinking Thinking by shifting fear to gratitude for Mother Earth. There is nothing wrong in life except the way we translate our thinking. We can use our thinking in an empowering or disempowering way. Empowered thinking is expansive with possibilities. Disempowered thinking is contractive, has few possibilities and is a lower frequency. So often, I think everything is ‘tanking’ and then BOOM…such amazing things come out of what appeared to be awful. Thinking more empowering thoughts is like buying an outcome you want. Facts are just facts. I remember once having a conversation with the CEO of a company that teaches the principles of success. I was lamenting facts in my life and how I just couldn’t see a way out of them and couldn’t shift to what I wanted. To quote him he said, “Listen to what you are saying. Now I’d like to invite you to translate everything you just said by writing the sentences on a piece of paper one sentence per line. Then go back to each sentence and indicate if it was of high frequency or low frequency.” By then I knew about frequency in relation to my life but this was new to relate frequency to my language. The good student that I am, I did exactly as he told me to do. Next, he asked me to circle each sentence that was of high frequency. Out of my 20 sentences, I had 4 high frequency sentences. The rest were condition based with no opportunity for what I would love to happen. I was just whining and complaining thus sending a signal to the Universe that I wanted more constriction, anxiety and worry. Up until that exercise, I wasn’t even aware that I was mirroring constriction to the Universe. You see the Universe mirrors back to us exactly what we are putting out. So I could see that I was spinning my wheels and didn’t even realize it. The Universe would support me in creating the dream that I saw and I was just learning how to utilize this support. The more I speak and think from a high frequency, the more I will receive a high frequency life in return. If I am experiencing happiness, it is because I am thinking happy. This translates into a true flight tracker for my life. I invite you to test it out. I love living with the Invisible Laws of Success and improving my experience of life. How about you? If you would like to know more about how to bring success and happiness into your life so you Step Up and Step Out, just contact me. You’ll be glad you did. Thoughts become things. That is a law of the Universe. All of us have a burning desire for something bigger and many times we create stories around this desire. They often sound like, “I’ll do it after the holidays,” or “I don’t have enough time,” or “I don’t have enough money.” What if time and money were not part of the equation on your journey to enhancing your vibration? Would you go for your dream? We can climb mount everest one step at a time. Our burning desire will step us into action if we decide for our dream. Now is the time! Our dream is more than just possible. It is necessary. When I stepped into my dream, it took courage. Traveling for 4 years was a shift in my wobbliness. I had to stay solid state and at the same time, I allowed my eyes to leak so my heart could open. I chose to install new paradigms and it changed the trajectory of my life. You can do that too. You see, I call these conversations ‘Dream Crushers.’ I had a dream to make a difference and at the same time I had paradigms that were hijacking my dream. Don’t we just all have those conversations? Don’t we all just see a bigger story for our lives and then take ourselves out of the game by what we say to ourselves? Perhaps we share our dream with a naysayer that feeds our paradigm and then we listen and believe the paradigm more than ever. That is why I had to get support from someone who believed in me and saw my greatness. There is greatness in you. Bring forth your passion. Can you see what it is for you? Are you ready to take the leap regardless of what your paradigm may be saying. You can do this. You have the wherewithal to Step Up and Step Out. Now is your time. Beginning October 24th at 4pm MT and continuing for 12 weeks. (We will take the holidays off.) All calls are recorded if you cannot make a call. Contact me for more information. I would be happy to give you a Complementary 30 minute strategy session to explore if this program would uplevel your vibration and change the trajectory of your life. It continues to do that for me. A Dream Builder kit with 12 CDs and worksheets to up level your life throughout the week. Clients report that they listen to these recordings over and over finding them extraordinary. Bonus #1: An individual session with me, your coach at any point in the 12 weeks to get clarification or calibration for your dream. Bonus #2: For a limited time, a copy of the Pebbles in the Pond book sent to your home. 45 International Authors including me telling their transformational stories. Download the free ebook June 14th through June 18th. It doesn’t seem possible that Step Up Step Out – Share Your Gifts and Be an Agent for Change launched just one year ago. So many exciting things have occurred since then. We all continue to grow and evolve as a human species by stepping up to make a difference for all life on this planet. Step Up Step Out has brought together numerous individuals for discussion and collaboration. What is yours to do? Now is the time for all of us to experience the freedom of sharing our gifts and being agents for change. Lynne Twist in her book, The Soul of Money shows us how we can replace feelings of scarcity and guilt with experiences of sufficiency and freedom. The world needs us to use our gifts and make a difference. What is my purpose in life? Why am I here? These words are being repeated all over the globe. Viktor Frankl once said, “Challenging the meaning of life is the truest expression of the state of being human.” We only know a small fraction of what is true for us individually and for each other. The possibilities are endless. What if we were aligned with our greatness and just did what is ours to do rather than waiting until we think it is the perfect time. Now is the time to Step up and out and we already are. People are getting off the couch and becoming active in their communities cleaning parks, teaching children to read, taking elderly neighbors to the store, and creating non-profits that stop human trafficking. There are over 1 million non-profits benefitting the public sector in the United States. Take a breath…’We are showing up’ in huge numbers. My passion lies with social justice for women and the rights of indigenous people around the world. Feminine energy is in all of us, males and females. For centuries, the masculine prevailed and cities were built from brain and braun. As the energy shifts to the feminine, we are beginning to see that cities can be built through the heart. We are dropping deeper into the core of who we really are as a species. The brain and the braun of our society are preserving the flora and fauna in our world as we realize extracting oil from the earth is not only not necessary, but there are other ways to create energy. We are exponentially mobilizing to stop the abuse against women and children and men see themselves for their greatness rather than their power. Now is the time. What is yours to do? Step Up and Step Out! 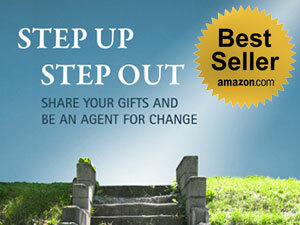 If you haven’t heard, Step Up Step Out – Share Your Gifts and Be an Agent for Change is now an award winning book through the Colorado Independent Publisher’s Association. So in celebration, I am offering this ebook as a free digital download from Amazon.com. The new ebook has colored pictures and a study guide for book groups. It is available for 5 days only as a free download. Help me share this message, “We can step up and out without past abuse defining what we do. As the world transforms, our individual gifts are needed to make a difference in turning things around.” Step Up Step Out is one woman’s journey to wholeness and a transition to sharing her gifts. Step Up Step Out – Share Your Gifts and Be an Agent of Change is launching on Tues., June 19, 2012. Today more than ever, people from every corner of the globe are questioning their reason for being on this planet at this time in history. Through her journey traveling around the world for four years, Carolyn became clear about who she is and what she came here to do in this lifetime. However, before this clarity arose in her, she had to peel the layers off her past history of child abuse to get to the core of what her gifts to humanity are. Are you an individual who…. *Is on a path to realizing exactly what your purpose in life and personal gifts are? *Wants to know that your life had meaning and made a difference when you leave this world? * Wonders what may be stopping you from stepping into who you know yourself to be? If your answer is a resounding “YES!” then Step Up and Step Out is a ‘must read’ for you! “Hart’s insights about re-patterning life, emerging from her inner and outer journey across time and space, offer wisdom and hope for all who are stepping out as agents of change for conscious evolution.” — Barbara Marx Hubbard, visionary, social innovator, educator, cofounder and chairperson of the Foundation for Conscious Evolution, author, Birth 2012 and Beyond: Humanity’s Great Shift to the Age of Conscious Evolution. Most of the time, I feel it serves me to be a little extra attentive, caring, supportive, and generous with people who cross my path. I feel good when I know I’ve really given someone my best, and helped them with that extra something. Needless to say, it’s takes a lot for someone to “cross the line” with me because I really do want to help as much – and as many – as I can. But, now and then I have an experience like I did earlier this week and I get to stretch and grow by taking a stand for myself… and that line. Here’s what happened, and what I learned. One of my subscribers to this ezine has complained to me in the past on several occasions pointing out everything I’m doing “wrong.” My wonderful assistant, Tina, has been as kind and understanding as she can be in her responses to this person. But, earlier this week when this subscriber emailed yet again tell me how much I’ve disappointed and hurt her and how she hopes there’s at least one person I have helped… my line got crossed. It made absolutely no sense to keep someone like that on my list just to have one more subscriber. I hold what I share here with you sacred; I value you and what happened in my community of subscribers. This person felt like they were polluting the waters here, and trying to throw her negative energy off on me. And, I wasn’t going to have anything more to do with it. What I learned is a deeper understanding that as I grow in reach and visibility, there will be more and more people who disagree with what I share, or simply don’t like me. And, it just doesn’t matter. I’m here to fulfill my bigger purpose and I can’t be bothered by those who chose to expend their valuable energy (or mine or my teams’) with complaints. I can’t help but think of that great quote by Dr. Seuss that says, “Those who mind don’t matter; and those who matter don’t mind.” So true! Here’s to taking a stand for YOU! Whether it’s removing someone from your list who is a complainer, completing a relationship with a difficult client, or simply saying “no” to something you don’t want to do. Taking a stand for yourself is an act of self-love, and you deserve that in everything you do. I recently participated in a workshop lead by Carolyn Rose Hart at the District 26 Toastmasters Fall Training Expo. Her training helped me to get more clarity around the standards of integrity that are the underpinning for my personal and professional life. The result was that I now am reminded of what these standards are for me. I especially liked her genuine and authentic approach and found the experience of her workshop to be thought-provoking. I recommend Carolyn for groups who are looking for speakers who can help participants discover and reaffirm their values and standards of integrity.